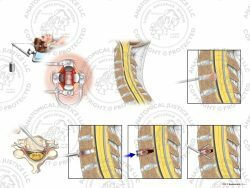 This exhibit depicts a C4-7 anterior cervical discectomy and fusion to relieve neural compression. The procedure begins with a left sided anterior incision to expose the cervical spine. 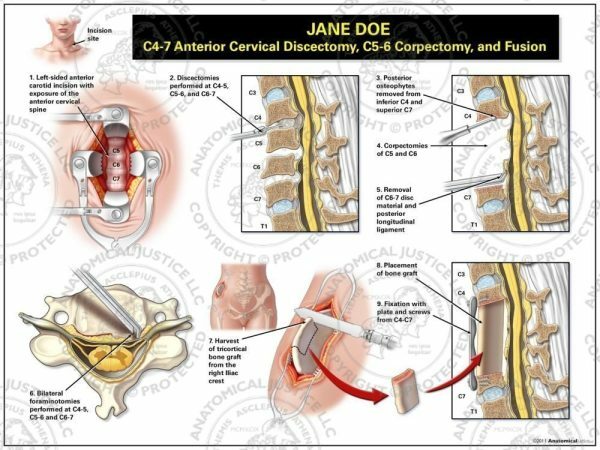 Discectomies are then performed from C4-7. Corpectomies are completed at C5-6, the endplates of C4-7 are burred, and the posterior longitudinal ligament is removed. Bilateral foraminotomies are executed at C4-7 to decompress the exiting cervical nerve roots. An incision is opened over the right hip and tricortical bone graft is harvested from the iliac crest. 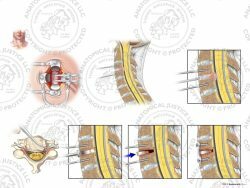 The graft is then placed into the disc space, and an anterior plate is affixed to the spine with screws.